Oct. 29, 2017 | Jessica Vanden Berg joins Des Moines Channel 13's Dave Price in an edition of The Insiders to discuss recent topics in the news, including sexual harassment claims and the World Series. 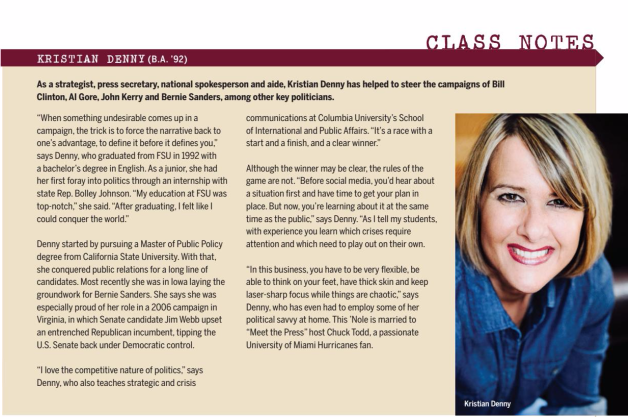 Dec. 11, 2016 | VIRES Fall/Winter 2016 issue, a publication of the Florida State University Alumni Association, features alumna Kristian Denny's career as a political strategist and the increasingly tough nature of working in crisis communications. Dec. 2, 2016 | As a democratic activist, Jessica Vanden Berg shares insights about democratic assessments and retooling after the 2016 presidential election. Sept. 11, 2016 | Jessica Vanden Berg joins Des Moines Channel 13's Dave Price in an edition of The Insiders to discuss Iowa marquee races. March 8, 2015 | Jessica Vanden Berg discusses current projects and why Democratic presidential contenders passed on attending the first ever Iowa Ag Summit. March 20, 2015 | Jessica Vanden Berg shares perspectives and insights on the state of politics in early 2015. August 9, 2013 | Jessica Vanden Berg spoke at a town hall meeting in Iowa the role of women in politics and electing a female president. Dec. 21, 2014 | In this article, the Des Moines Register lists the top 50 influencers, including Jessica Vanden Berg, for the Democratic presidential caucuses.